Reusable freezer bag, half gallon size! 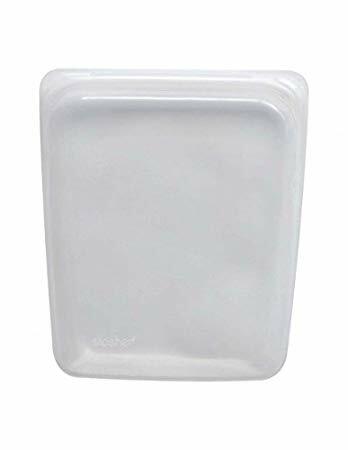 A plastic-free silicone bag ideal for cooking, freezing, storage and travelling. Easy-to-use and easy-to-clean and non-toxic. Reusable freezer bag, half gallon size! A plastic-free silicone bag ideal for cooking, freezing, storage and travelling. Easy-to-use and easy-to-clean and non-toxic. This Stasher half gallon bag will safely go from the microwave, oven, fridge, freezer or dishwasher. Use it again and again! So go on, stash it all in Stasher - the healthy alternative to plastic. Stasher is freezer safe, but use caution carrying and storing liquids. It should be okay to fill the stasher bag with liquid and place it upright in the freezer. Dishwasher safe - use the upper rack for best results. - A reusable plastic-free bag. 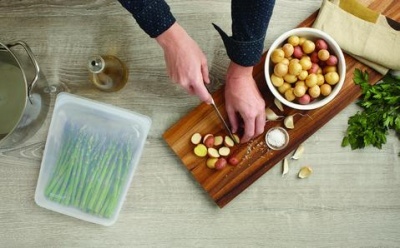 - Stasher is perfect for stovetop and sous vide cooking. Produced responsibly in China. Paper packaging.